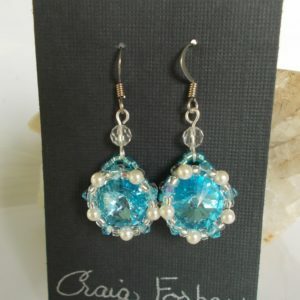 For your sensitive ears … Aquamarine Rivoli Earrings handcrafted by Craig Forbes Designs. Features a Swarovski® sparkling Aquamarine blue rivoli nestled inside a wave of creamrose pearls and Swarovski® bicone beads, dangling on a Sterling silver bail, all on a French earwire made of high-grade surgical steel. The earring is mounted on a French hook earwire. The earwire itself is made from a base of surgical grade stainless steel and then polished to a mirror shine. 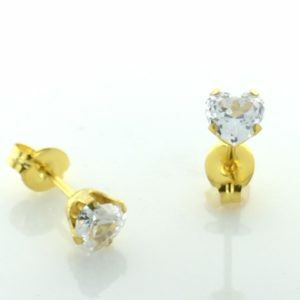 Each pair comes with a set of clear plastic earwire stoppers. The stoppers give you confidence of a secure fit so you can wear them without the fear of them falling out. The designer, Craig Forbes, has been making his unique creations for many years in Sterling, Colorado. He prefers a bolder look with interesting artifacts and color selections that make his artistry stand out from the rest. 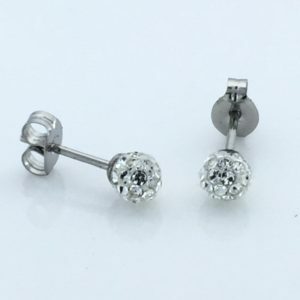 Each of the hooks, posts, and wires that touch the piercing are made from hypoallergenic parts to provide you with the best protection possible. Craig will be introducing new styles with each season and will continue to do so for a long time in the future. Committed to excellence and continually looking for fresh variety, the Craig Forbes Designs line of earrings and other hypoallergenic jewelry will evolve and grow in the coming years. Craig prefers the weaved look and selects more substantial stones for some of his work. However, he also diverges and offers some surprises in his offerings as he explores different ideas and brings them to you through Sensitively Yours.